Whether you're a novice or a pro, take your guitar playing to the next level using the Guitar Mechanics™ method! a condensed method for learning ​how to master the guitar. reallY! Guitar Mechanics™ is the condensed method of learning for total understanding of the guitar. From power chords, to fingerpicking, from learning how to play your favorite songs, to composing your own music, the Guitar Mechanics™ method is the most complete system for mastery of the guitar. Whether it's chords, scales, rhythm or transcribing solos... any style; blues, rock, country, jazz or pop - Guitar Mechanics™ is the answer. 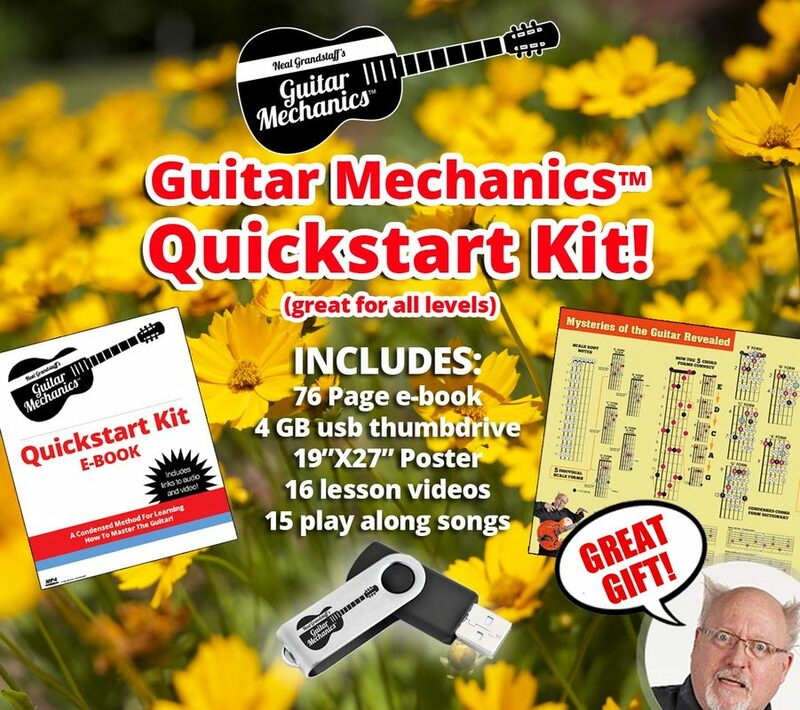 Guitar Mechanics™ was developed over 40 years ago by master guitarist Neal Grandstaff to demystify the learning process and give you access to a deep understanding of the instrument so that you can reach your goals. Other systems fall short in providing guitar students with a method that truly prepares them for a career as a professional musician, teacher or player. With the Guitar Mechanics™ Live Online Lessons you get personalized coaching and guidance from professional guitar teachers. You get access to a vast library of videos on technique, theory and performance that you can get nowhere else. "Neal is easily the best professor I have ever had in my life! I don't even want to call him a professor because he cares about teaching his trade more than anyone educational instructor I have ever known. BE THE NOTE". "I love this man. He is by far the best professor I've had in college. He has made me very interested in music and thanks to his teaching I have been able to get into the ranks of working musicians." "He is amazing! If you are passionate about guitar, sign up for his lessons and you'll get so much better!!" "Neal has high expectations, but the work you put into his method and classes does pay off. By far one of the best professors I've had here at Oregon State University." "He is one hell of a teacher and an even better guitar player. You might even learn a thing or two about the music industry while you're there. Practice your scales and never stop playing". The beginning of the beginning! One of the best values on our site. What is the gman institute?